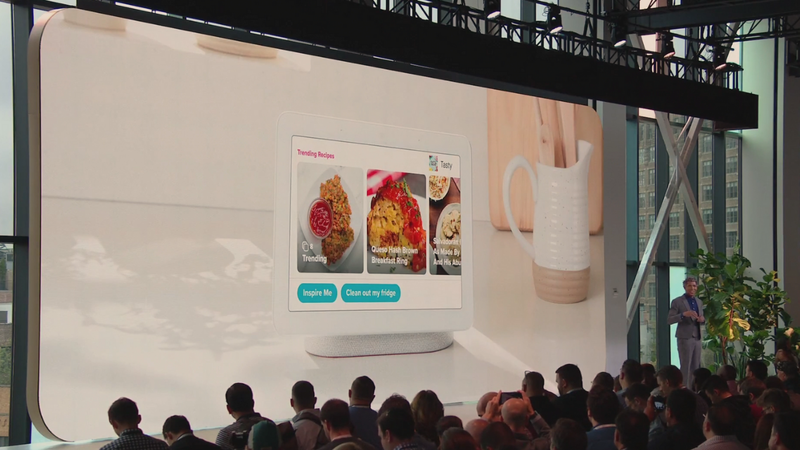 During Tuesday's Made by Google event, Google unveiled the Home Hub, a new Google Assistant-powered device meant to compete with Amazon's line of Alexa-enabled products and the bizarre new Facebook Portal. The Home Hub doesn't feature a camera, but it does include revamped services such as YouTube, Maps, Search, Calendar, and Photos that add augmented voice controls, more information at a glance, and support for Google's Voice Match feature. This means it will be able to adapt and recognize different users' voices while pulling up visual reminders and other information right on the home screen. The Home Hub won't include a camera, however, which makes sense given the current climate with privacy concerns, so you won't be able to conduct video Hangouts on the device, but you won't have to worry about whatever else it's seeing, either. You can grab the Home Hub in four colors: pink, dark gray, white, and green, if you're so inclined. The Google Home Hub is available to pre-order today for $149, and you'll get six months of YouTube Premium with it if you decide to pick one up. It will officially debut on October 22 in the US, UK, and Australia.